Liepāja is a town in the West of Latvia famous with the wonderful beach, cultural heritage and charming historical low-rise architecture. The population is 85.000 and keeps dropping. So far policy-makers have worked to fit all development projects in the existing environment and hadn’t done anything to encourage modern high-rise development. Liepāja doesn’t have an impressing historical skyline but have a chance to get modern one. 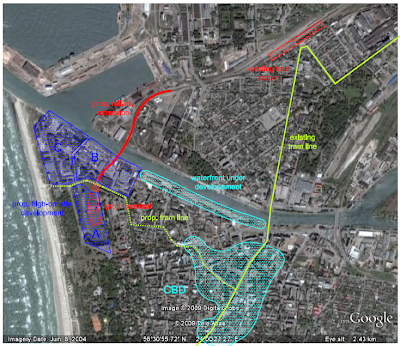 I propose a way to convert existing port and waste territories south of city channel (see map) to a modern skyscraper cluster. This area is on edge of the historical old town, next to the beach and seaside park. Current railway station in Liepāja is located 1.8 km from central (Rožu) square - booth are connected by the only tram line in the town. Due to train shortage existing intercity train service is ridiculous - just one daily train to Riga. If more trains are put on service – especially tilting ones – rail connection to Riga and Jelgava will easily beat the coach service. As Liepāja is a seaside resort – seasonal rail services may be established from all biggest Baltic cities. A new railway link and terminus are essential to create a motive for high-density land use in the area. I propose building an underground station in the site of the old stadium and to connect it to existing railway through tunnel under the city channel. A new tram line to the center must be built to provide accessibility for the rest of city. It is worth adding tram lines to Ezerkrasts, Karosta, and a higher standard line through airport to Grobiņa. Lot A is the very first to be developed because the railway terminal construction underground. All historical fortifications and pounds must be preserved but the rest can be built-up with no height or density restrictions (as higher as better). In lots A and B all buildings (and functions) must be preserved as long as possible. New high-rise buildings must be built in gaps between existing ones. Different functions must be left together - retail, residential, hotels, offices, fish warehouses and docks – to makes the urban life more attractive. Lot C must be developed later than lot B to make the more important development of lot B faster. Seaside parks and the channel waterfront would strongly benefit from the proposed development because of the increased number of visitors. The influence to historical center is unclear – it may loose some services but the improved accessibility probably will outweigh losses. The current train station area will face problems only if buss station is moved together with train station to the new district. All the other areas of the town and region would see strong benefit from tourism and other business. Building a new tunelled rail link and station may seem too ambitious for Liepāja, but I believe it will induce even more rail trafic and bring the city to a new level of development.